WHAT: To kick-off the Fall season, Clinique Global Colour Artist, Jenna Menard, will be hosting an exclusive master class at Bloomingdale’s 59th Street teaching guests how to achieve her favourite makeup looks of the season. Guests will have the opportunity to participate in the intimate class where Jenna Menard will provide step-by-step demonstrations, followed by a one-on-one consultation with a Clinique Consultant who will replicate the look created by Jenna. 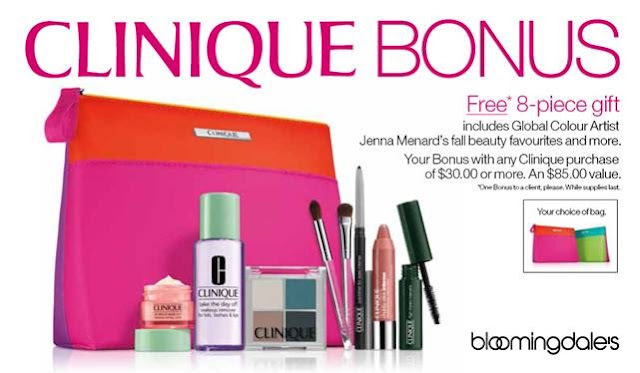 Jenna Menard will also be on-hand at the Clinique counter to meet clients and answer additional questions. Guests who participate in the Master Class will also receive an exclusive gift, containing Jenna Menard’s hand-picked favourites for a fresh take on Fall that will help replicate the looks created during the Master Class. The Bloomingdale’s exclusive 8-piece gift includes an All About Shadow Colour Quad Compact, Two-piece Brush Set, High Impact Mascara in Black, Chubby Stick Intense Moisturizing Lip Colour Balm in Curviest Caramel, Quickliner for Eyes Intense in Intense Ebony, Take the Day Off Makeup Remover and All About Eyes Rich, all contained in a colourful cosmetics bag. Each Master Class session will last approximately 45 minutes with additional one-on-one time with a Clinique Consultant, and can be pre-booked for $50.00 (to be redeemable in product) at the Clinique at Bloomingdale’s 59th Street in person or via phone by calling 212-705-2879 if preferred. wow sounds great! wish I was there!! !